The skeleton of “Joe” the dinosaur was back at the museum, but it wasn’t even close to ready for scientific study. 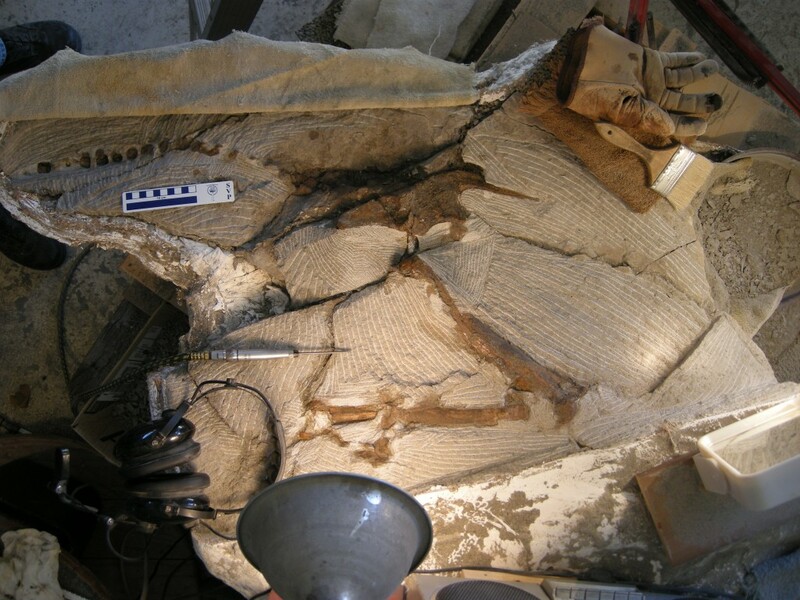 Most of the fossil was covered in concrete-hard rock, and some of the bones were badly fragmented from exposure to the elements prior to discovery. “Joe” needed some serious attention! 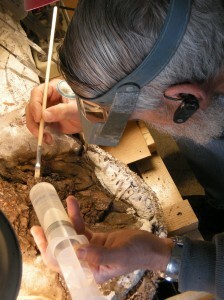 Professional fossil preparator Mike Stokes (who also directed the excavation) took the helm in cleaning the skeleton of “Joe.” Using air-powered tools, similar to dental drills, Mike painstakingly removed rock from the bones, sometimes sand grain by sand grain. He injected glue to stabilize weak spots in the fossil block, reattached broken bone fragments, and kept a constant photo record of the process. When a fossil is collected, paleontologists often only have a rough idea of what it will turn out to be. The same was true of “Joe”! The skeleton was initially thought to be missing most of its skull, aside from the initial piece found in a loose block. The remaining pieces were feared lost to the elements. However, careful exposure revealed that the entire left half of the skull was still intact! This was exciting news, because skulls are critical for identifying dinosaur species. After nearly 1,300 hours of careful work in the lab, spanning two years, the skeleton of “Joe” was ready for scientific study! The skeleton of “Joe” took one technician a total of 1,270 hours to clean. Working from 9 to 5 (with one hour break), that’s 159 days! Compared with 13 days for the original excavation, this means that one day in the field was matched by over 12 days in the lab. It takes a lot of work to clean a fossil! The skeleton of “Joe” was slowly revealed only after hundreds of hours of work. Here, the leg bones are just beginning to be exposed.